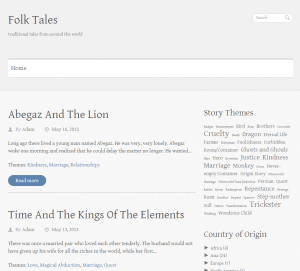 Members of the guild are working on a new website, www.folk-tales.org, which is going to be a repository of searchable tales for storytellers. A primary goal of the project is to provide a collection of themed folk tales suitable for all ages and tagged according to themes, so that for example a storyteller can search for a collection of stories that all have the theme “marriage”. To this end, a fair amount of programming is being done in order to provide the ability to suggest themes according to existing classified stories.